Might be a DT connection????????? Breakers????????? The cover will be revealed tomorrow. My thoughts exactly. I'm generally not one to clamor for a new DT book, but I've always thought the breakers were relatively under-explored, so this could be a good thing indeed. It seems PS Publishing will (or plans to) release its version of The Dead Zone this year as well, after The Stand. It will be illustrated by Tomislav Tikulin. Now where is Needful Things? As usual, the US cover is much better. Would love to see a Centipede or Suntup version of the DZ. I can't find a product page for the book on Amazon UK. IDK, still sounds better than "Sleeping Beauties"!!!! I kinda like the comparison to Firestarter. Could be a really good one on the face of it. I think for the first time ever, I prefer the UK cover. Both covers have a generic YA feel to them. Fonts are important; I'm with you there. I agree that the one for his name is pretty generic (not to mention huge, but I guess that's a requirement when selling a book by STEPHEN KING). I like the font used for the title though; it feels cozy, in the sense of being taken away by the story. 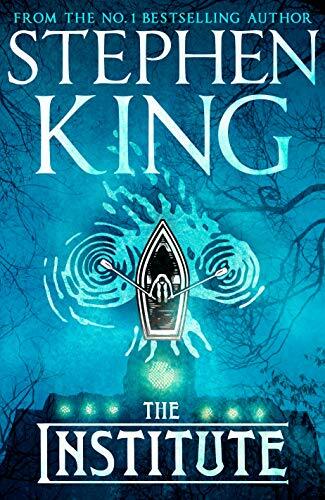 I also prefer the UK edition's image (overhead "shot" of a rowboat) to that of the US edition; I find it more evocative than the US cover, but then, I can't deny that a train with that interior is evocative as well. I don't understand why there can't just be one cover. I always thought that if I were a published author, if I liked the cover the US edition ended up with, I would consider it "the" cover and would forever be irritated by the existence of others (but those are some significant ifs in that sentence). I generally prefer the U.K. Covers. This one is a bit blah, though. I'm sure the w h smith edition will be a nice shade of purple, though. I agree about the fonts - particularly the title font. The author font is generic, but better that than the hideous font they used in the U.K. Between Cell and Just After Sunset. It made his work look like cheap schlock. Earlier there was only the ebook page, but not there seems to be the hardcover page too. Far away in a small town in South Carolina, former cop Tim Jamieson has taken a job working for the local Sherriff. He’s basically just walking the beat. But he’s about to take on the biggest case of his career. But great events can turn on small hinges and Luke is about to team up with a new, even younger recruit, Avery Dixon, whose ability to read minds is off the scale. While the Institute may want to harness their powers for covert ends, the combined intelligence of Luke and Avery is beyond anything that even those who run the experiments – even the merciless Mrs Sigsby – suspect. Thrilling, suspenseful, heart-breaking, The Institute is a stunning novel of childhood betrayed and hope regained. The NBA in particular is home to some of the most nightmarish (Minnesota's highlighter-green) and coolest (any of the single-color Christmas day ones) uniforms out there. "Throttle" and "In the tall grass" will be reprinted in Joe Hill's next collection 'Full Throttle" to be release in october. "Eleven short stories from award-winning author Joe Hill, building on the success of his blockbuster novels. Some new, some previously published, all terrifying. Includes FULL THROTTLE and IN THE TALL GRASS, both collaborations with Stephen King and both being filmed at the time of writing." And as I always thought, I am guessing that the "In the tall grass" movie by Vincenzo Natali will be released at the automn on netflix, probably by the release of the book... before halloween? In 2018 Nick Wechsler bought rights to "Throttle" but that's all there is about it. And yes, Hill's book is set to autumn premiere to be supported by the movie and movie by the book.